particularly when the red salmon are running in the Russian River. you are limited to a three-day stay here; reservations are available." What a nice campground! We loved it. If you fish, you'll like it even more than we did. We can enthusiastically recommend Russian River CG, but if you have a large RV be careful which site you choose if you make reservations without having seen the site first. As we've discovered previously, site length and width aren't the whole story. This is the great site we ended up with, a "double:"
Unfortunately, it's not the site we reserved online, based on length and width. And that caused a problem for us. This is one of several reasons we're hesitant of making reservations ahead of time at campgrounds or in areas where we've never been before. We learned about the Russian River CG from the Alaskan Camping book, which has excellent descriptions and information. So far we've been very pleased with this camping guide. 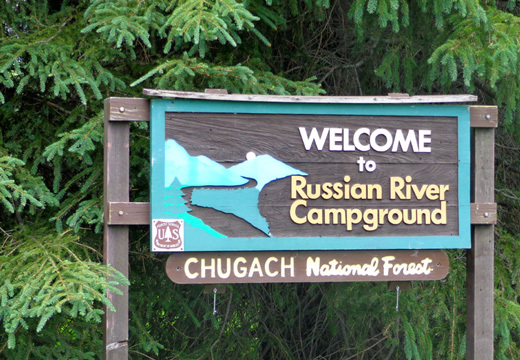 We made reservations online at Russian River a couple weeks ago after being unable to make any campground reservations in Seward until after the 4th of July. Considering it was a holiday week we were pleased to be able to reserve a large site during the red (sockeye) salmon run at this popular campground. We had to choose a site blindly when we made the reservation. That often happens when we have to choose a specific site rather than picking one from what's available when we arrive at a campground. Either way has its risks if you have a large RV. We checked in near the entrance off the Sterling Highway, then drove back about two miles to our site. On the way in Jim filled our fresh-water tank with enough potable water to last for three or four days. There are no water hook-ups at the individual sites. There are some water pumps in the loops but the pump across from the dump station has the only threaded faucet in the campground. With a threaded faucet Jim could use our hose to more quickly fill the camper tank directly than using our water containers and the pump system he devised for use when we're boondocking. When we got to our assigned loop we discovered the site we reserved is too difficult to get a 36-foot 5th-wheel coach in without a crane. Seriously! 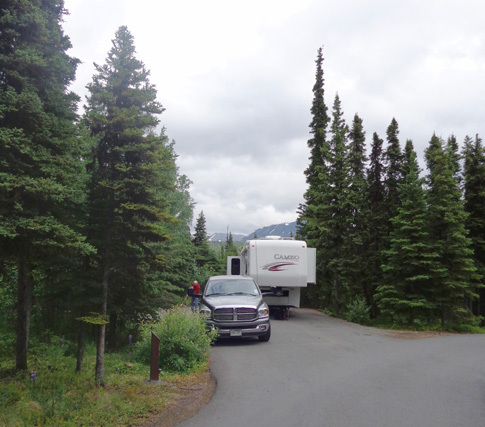 The narrow entry to the site was not only bordered by trees, it was also the harder way to turn (toward the blind side, not the driver's side) and there was no room on the other side of the road for Jim to maneuver the truck. He risked running into several trees and a water pump directly across from the site. He tried backing the camper in several times and finally gave up. Jim�s very good at backing the Cameo into tight spaces so it wasn't a matter of a lack of skill. Ironically, when he made the reservation he wondered aloud if this would happen. It's happened to us before and it's bound to happen to us again. As I said, it's one of the reasons we dislike making campground reservations in advance. 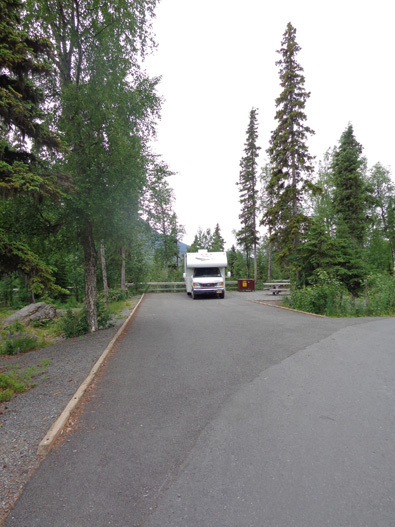 If you have a small to medium-sized camper you should be able to fit into any of the sites in this campground. That's the kind of thing that drives us crazy. We drove around our loop again, noting four empty double sites that would work well for us. It was past check-in (2 PM) by then and we knew the sites could be filled either by reservations or by someone coming in after us and lucking out. We drove back out to the entrance station to see if we could get another site. The young men who were working seemed to do their best, considering only three sites out of 83 are available the three days we want (July 2-4) and they are all single-width sites that are too small for our rig. But they could let us occupy one of the double sites in our loop that we�d noted as accessible for us for the first two nights. We chose the one shown below (and at the top of this entry). Someone has the site reserved on July 4 only so we'll probably have to move out that morning. The guy said he�d talk to his supervisor this afternoon about it because he�d be working on July 4 and could ask the folks if they could take another site. Problem is, we have to vacate the site by noon that day, which will mess up our day if we want to go anywhere. This is a great site. We�ll enjoy it for two days and figure out what to do about the third day later. There was no refund or additional fee. Single sites are $18/night or half that for us with our NPS senior pass. We�ve already paid $27 + $9 reservation fee = $36 for three nights. Double sites are $28/night or half that for us = $28 + $9 reservation fee = $37 for two nights, close enough if we can stay only two nights instead of three. We have several choices � hang tight on Wednesday and hope we can stay that night in case someone doesn't show up (since all the sites big enough for us are reserved that day), see if we can arrive a day early in Seward (not likely, with all the July 4 stuff going on there), or spend the night boondocking somewhere between here and Seward. 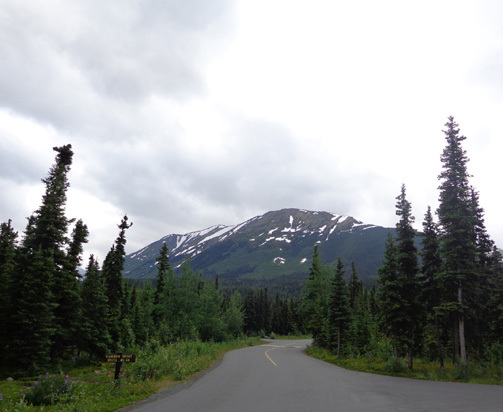 We noted a spacious, scenic turnoff on the Sterling Highway today that would be a good place to stay overnight, if necessary, and there may be more farther south on the Seward Highway. 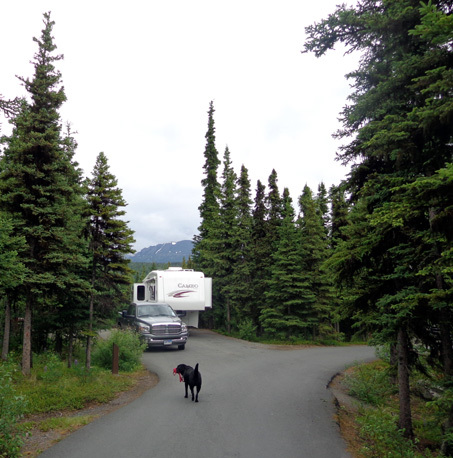 This is a very nice campground with five large loops with paved roads. 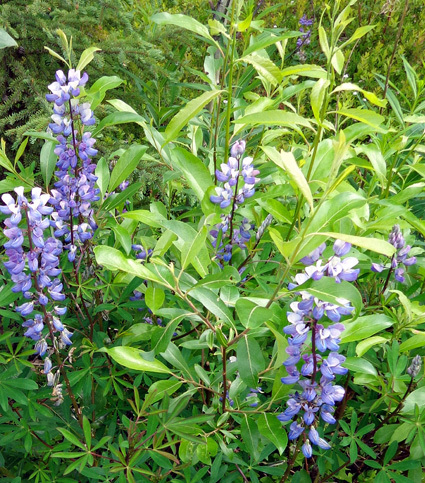 Almost all the sites are spacious, with plenty of trees and shrubs separating them. 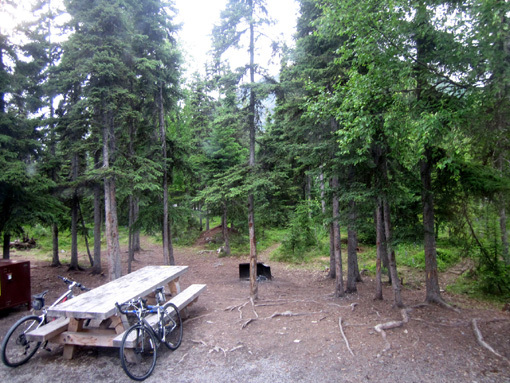 All sites have paved pads, a picnic table, a bear-proof box for food and supplies, and a fire pit. Each loop has either vault or flush toilets. There are no water, electrical, or sewer hookups at individual sites. Generators can be used between 6 AM and 10 PM, which is pretty generous. National Forest campgrounds tend to have less restrictive generator hours than national park campgrounds. 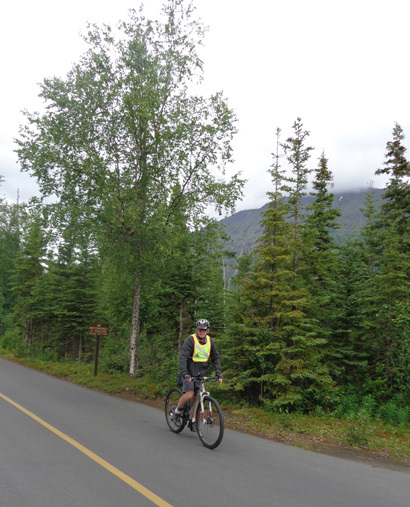 Jim rides on the campground road. We rode our bikes around the loops to see what the other sites look like and to note which ones are suitable for our camper if we decide to come back here later. Our site is flat; some are more sloped. 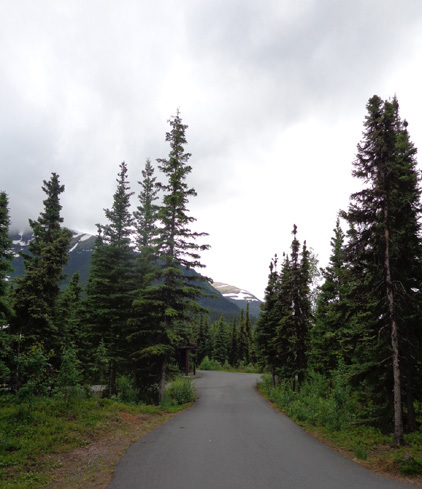 We have plenty of room on our paved pad, lots of trees, a nice mountain view, and no other sites close to us. We can't see any other RVs from our "front yard." This area is extremely popular with folks who fish. In good years, when red salmon are plentiful and there aren�t limits or bans on catching them, this place is packed. Hence, the general three-day limit for camping here. Right now the campground is only about half full. This year there are bans and limits here and in other parts of the state because the salmon population is way down for some reason. That may turn out well for us if there are fewer people camping here this week. 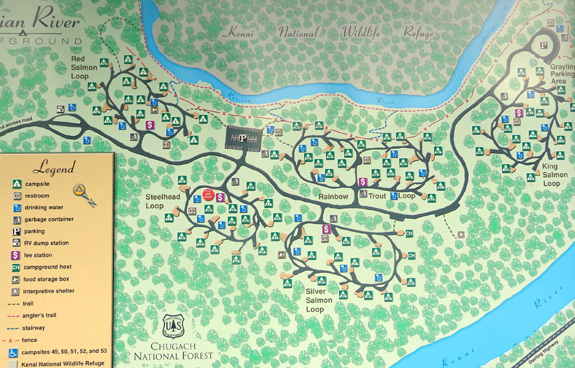 Don't hesitate to stay in this campground if you aren't an angler. 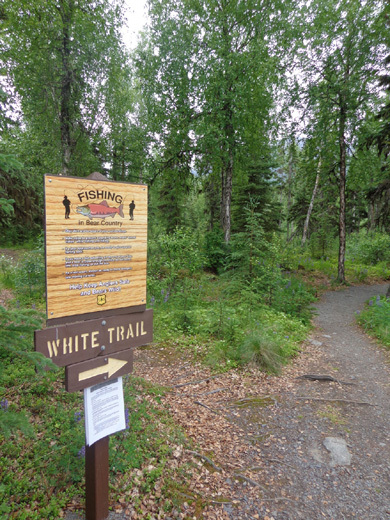 There are other recreational activities in the area like hiking, cycling, boating, horseback riding, and gold panning and a Native Alaskan cultural center across the road from the entry to the campground. I'll be talking about the hiking/cycling trails that can be accessed from the campground in the next few entries. I'll take you there in the next entry. Jim spent a couple hours outside the camper this afternoon while Cody and I walked down at the river. He thinks he saw a bobcat, a brown animal about half Cody's size with a bobbed tail. Black and brown (grizzly) bears are abundant around here but neither of us has seen one yet in or near the campground. We'll need to take our bear spray when we go farther out on the trails tomorrow.